A greasy spoon cafe in Lewisham, just to the rear of Lewisham Station. There are two rooms inside, one with the till and the kitchen behind, and the other with a bar. Music usually plays inside. There are also some tables outside by the road. 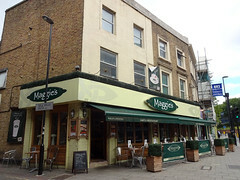 It's named after the owner, Maggie, and has been around since the 1980s, with Maggie's sons now having joined the business too. It's particularly notable for its "create your own breakfast" (£8 as of June 2018), which includes as many items as you want from a list of 20 (fried eggs, poached eggs, scrambled eggs, sausages, veggie sausages, bacon, mushrooms, black pudding, liver, fried onions, chips, hash browns, bubble, beans, grilled tomatoes, tinned tomatoes, ham, fried slice, toast, and bread) as well as unlimited coffee and tea refills. Ewan has been a few times over the years, trying both vegetarian photo from Oct 2007 and meaty photo from Nov 2011 versions of the create-your-own breakfast. Kake visited on a Tuesday morning in June 2018. There were eight or nine other customers in when I arrived around 9:15am, and more came and went while I was there, including a group of seven who were seated on a long table in the next room. I went for the create-your-own breakfast (£8), choosing poached eggs, mushrooms, hash browns, bubble, beans, tinned tomatoes, ham, and bread photo. The bubble was a large portion, but a bit watery and not very well browned. The mushrooms were bland, and some of them quite undercooked, with one almost raw. The poached eggs had mostly-solid yolks and partly-runny whites, which is the wrong way around. On the other hand, the tinned tomatoes were good quality — well-flavoured and not too liquidy — and the ham was decent quality without being overly fancy. The beans were fine, and the hash browns were well-crisped and not at all greasy. Service was friendly and welcoming, and Maggie herself was constantly circulating around, chatting to regulars and filling up everyone's tea cups without having to be asked. No service charge was added to the bill, and there was nowhere obvious to leave a tip. Ewan's verdict: A very friendly local caff which is particularly good for the "create your own" breakfasts. Accessibility: A large step to get in. No further steps to the toilet (a single unisex cubicle). Last visited by Kake, June 2018. Opening hours taken from the menu, June 2018. Last edited 2018-06-20 15:18:34 (version 6; diff). List all versions. Page last edited 2018-06-20 15:18:34 (version 6).